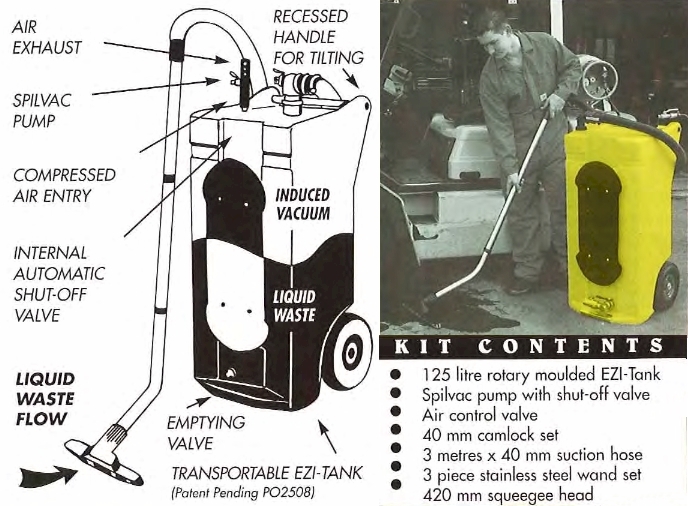 The Spilvac SV-20 is a compressed air operated liquid spill recovery unit (drum pump). It recovers spilt liquid without creating further environmental problems. As there are no mechanical or electrical components in its drum pump construction, there is no risk of a spark igniting fumes or liquid while recovering flammable materials in an emergency situation. SV-20 is a positive and cost effective solution to handling liquid spills. The venturi that powers the unit is constructed to create a tornado effect whereby the air being fired through the venturi creates a vacuum in the 20 litre drum. It can recover 20 litres of liquid in 12 seconds. The unit is light in weight and easy to use. It is supplied with a wall mounting bracket for easy access and is finished in safety yellow, making it easy to sight in an emergency situation. The hose connector also doubles as a pouring spout to aid in emptying the tank. The recovered liquid can be poured from the collection drum into proper waste tanks for responsible disposal or recycling, eliminating the pollution problem that could be caused by burning or throwing away used absorbents. Can you afford industrial spills? As our responsibilities towards protecting the environment increase, industry has to consider the manner in which it handles liquid spills. The Spilvac SV-125 spill recovery unit provides an environmentally friendly solution. The SV-125 is a positive and cost effective solution to handling liquid spills. 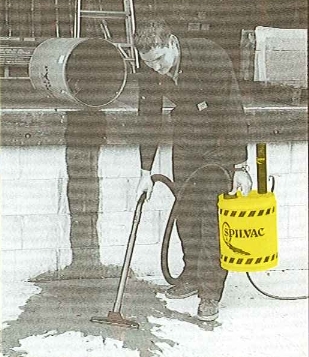 Spilvac SV-125 is a powerful pneumaic recovery unit that can clean up liquid spills and prevent pollution of the workplace and environment. 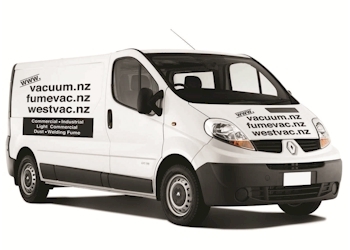 Spilvac SV-125 is easily connected to an air line and is capable of recovering 125 litres of water viscosity in 75 seconds at 100 psi line pressure. Unlike absorbent materials Spilvac SV-125 can be used over and over again. Recovered liquid can be poured out of the 125 litre tank for reuse or recycling. 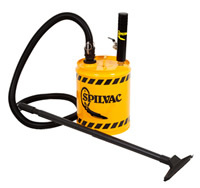 Spilvac SV-125 is a positive and cost effective solution to handling liquid spills. Mobi-Pumphas been designed to dispense liquids from 200 and 60 litre drums. Powered by compressed air to generate a small pressure differential between the drum and atmosphere, Mobi-Pump is the fast, efficient and safe way to dispense liquids, with full control of the liquid flow from the dispensing nozzle. Mobi-Pump has no moving parts, and does not come into contact with the liquid being dispensed, providing long life, low maintenance and safe operation with flammable liquids and most chemicals. 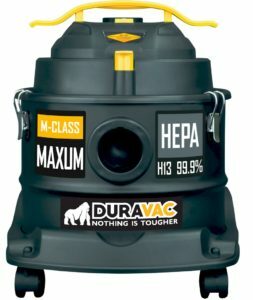 Screw the Mobi-Pump and spear into the drum, attach the dispensing hose, connect the air supply, and your away. Empties a 200 litre drum of water in approximately 5 minutes. The Blovac Dragin Pump has been designed to recover liquids from machine tools, sumps, open pits etc, into a standard closed-head drum. Powered by compressed air to generate a vacuum in the drum, Dragin Pumo is the fast, efficient and safe way to remove coolants, used oil, solvents, sludge, hydraulic oil, metal chips and other industrial waste. To ensure safe operation, Dragin Pump incorporates an automatic shut-off valve which operates when the drum is full. Dragin Pump has no moving parts, and does not come in contact with the material being recovered, providing long life and low maintenance. Screw the Dragin Pump and the suction hose into the drum; connect the air supply and you’re away. Recovers up to 40 litres of liquid per minute. 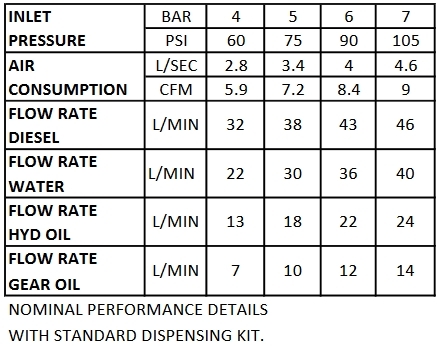 Warning: the standard Dragin Pump kit is not suitable for corrosive or flammable liquids. the ASK and SKK models are available for these special applications.